Popstar is a video slot created by GIG Games, taking place on the big stage of a music competition. With millions of eyes tuning in to watch the spectacle, only the very best may advance. Join our talented star, Erik, as he attempts to woo the judges and the crowd. With your guidance and a bit of luck, he might just end up in the finals. After that, it’s one final performance that will make or break his career. Will lady luck be on Erik’s side or is he doomed to flunk the final? We like the colour choices and the animations. However, it is clear the developers made them loop in several places where they should not. Trust us, you will know it when you see it. The game has one special feature, with several layers. First, you have the traditional free spins, but also symbol collection and icon swapping bonuses! If everything goes well, you could hit a jackpot worth 500x your total stake. The symbol design was quite well done, we have to admit. While not all icons have unique designs, all of them fit quite nicely. Higher paying symbols include Erik and the four judges, while low-value icons are playing card royals. The artists did a good job at making the letters and numbers fit in by making them with neon sticks. Wild shares a similar design, while a golden microphone represents Scatter. The slot is played on a 5x4 board with 1,024 ways to win. The layout has been changed slightly compared to the usual GIG Games’ one. It feels a lot more minimalistic, with all non-essentials pushed off to the side. The Autoplay, Spin and Total Bet buttons occupy the centre of the playing field, in that order. The Autoplay function remains the same as in other releases by the same developer. Meanwhile, pressing the Total bet button lets you choose your wager between $0.20 up to $10 per spin. 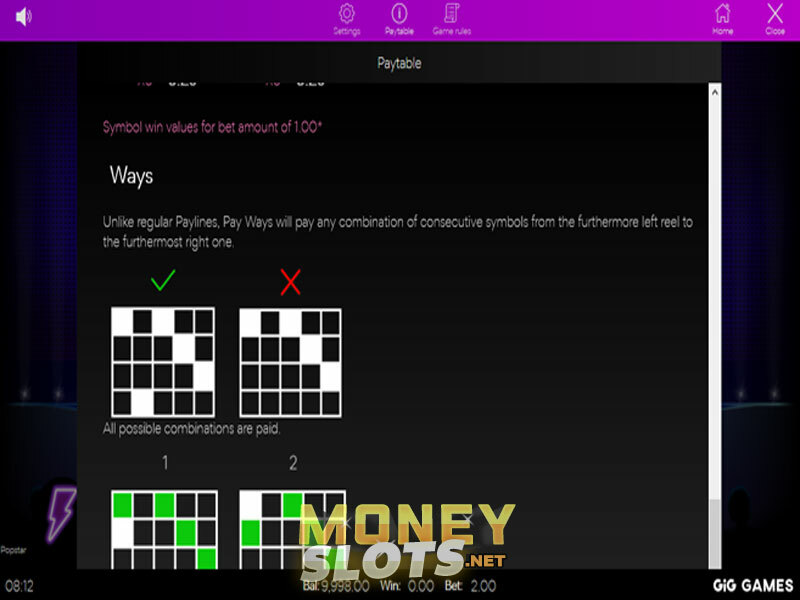 To land a win, you need to collect three or more identical symbols in consecutive positions from left to right. Since Popstar does not use set paylines, any winning combination that fits these criteria will pay. The exception to this rule is the Erik icon, which can grant a small prize with only two symbols. Collect three, four or five Microphone Scatters to win between 6 and 14 free spins. The number of free turns is determined by the number of Scatters that activated the bonus. While free spins are already active, collecting two or more Scatters will net you extra free turns. During the special feature, four judge symbols can appear with a golden ticket. Each time this golden ticket appears, it fills a meter next to one of the judges. Collect six golden tickets with one judge to win two more free spins. A completed meter also transforms that icon into Erik, the highest paying symbol in the game. There are very few differences between the desktop and mobile version of Popstar. The visuals, gameplay and rewards all remain the same, no matter what platform you play on.